Perhaps you will ask "What's a conifer?" In very general, non-botanical terms, those are the plants that hold their leaves (needles) all year long. "Evergreens". At Aldrich Berry Farm & Nursery, Inc conifers and other native plants take up about a third of our efforts. Such things (the ordinary) Douglas fir, Noble fir, Western Red Cedar, Western Hemlock , Mountain Hemlock, Shore Pine are, at once, 'native' and 'conifers'. 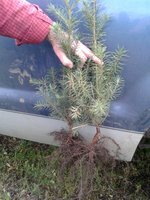 But we also produce seedlings and transplants for Christmas tree production as well as for ornamentals and a short list of native plant shrubs. Normally, using seedlings/transplants is the most economical way to get a plantation established. Or, perhaps you are wanting to establish a property-line with a row of trees in which case you might be willing to use a balled-in-burlap or a containerized plant; more cost but plants are bigger and less risky to establish than seedlings. Or for your yard or driveway a few nice larger landscape-size trees up to 10' - 14' from our limited selection. Roots are "half" the plant. 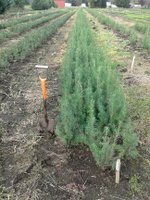 Establishing a plantation for timber or Christmas trees is not particularly difficult. Having your ground ready to receive plants is important; soil with adequate (but not excessive) supply of moisture, good tilth, freedom from weeds, and adequate plant food is important to have before you plant. Some of these conditions can be remedied after planting but with more difficulty than having them taken care of prior to planting. Species which we normally offer for plantations include Douglas fir, Noble fir, Western Red Cedar, Nordman fir, Turkish fir, and Arizona Corkbark fir. Contact us at galdrich@tds.net. For production of decorative boughs we regularly offer transplants of California Incense Cedar and Western Red Cedar. Are you looking for plants to restore a native area? We offer a limited selection of native shrubs to go with the native trees we offer. Such things as vine maple, hazelnut, red stem dogwood, yellow stem dogwood, twinberry, highbush cranberry, salmonberry, thimbleberry, amelanchier, and native willow are among our offerings. Contact us at galdrich@tds.net.